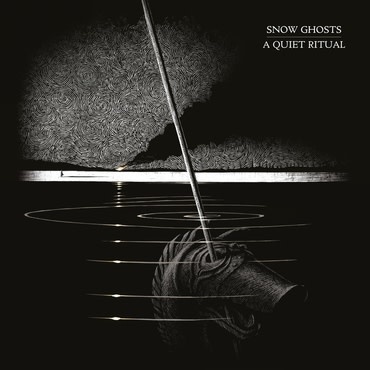 Snow Ghosts release their third album, A Quiet Ritual. A chaotic blend of visceral, frenzied energy and haunting lyricism, Rip deals with the violence of grief in its suddenness and cruelty. Unnerving discord and pulsating ambience permeate the track, with semi-spoken vocals and powerful instrumentation building to an expressive climax of cathartic release. Centring on the theme of death, the album seeks to process the shock and grief of bereavement and its aftermath, as well as casting back across history and other cultures for their own metaphors and coping strategies. Recorded in a castle in the countryside and two years in the making, A Quiet Ritual is written for an ensemble of classical and modern instruments including the Carnyx, an Iron Age Celtic boar-headed horn excavated from a bog in Deskford, Scotland. For the Carnyx, they enlisted the services of John Kenny, one of just a few musicians able to play the instrument and the first to do so in modern times. The mix of instruments is indicative of the idiosyncratic timelessness common to this album and all of their previous works: having had a historical context present on their previous albums, the inclusion of the Carnyx ties the release together, combining ritualistic themes with an instrument commonly used in rituals or as an offering in ancient culture.